Not quite sure what to get that special someone? Let them decide! 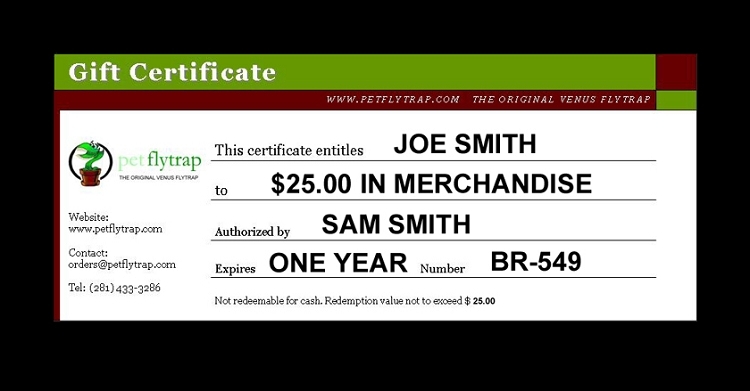 These $75.00 gift certificates may be used as payment toward any products on any order placed on the PetFlyTrap.com web site. This is an easy way for you to get something for a special carnivorous plant enthusiast, but still allow them to choose the exact item(s) they want. Gift certificates can be personalized by contacting us after purchase, and these are usually e-mailed directly to you or the recipient for printing out...even at the last minute! Good for six months from date of purchase. PLEASE NOTE that due to settings beyond our control on the web site, gift certificates only are valid for merchandise, and may not be used toward shipping charges.